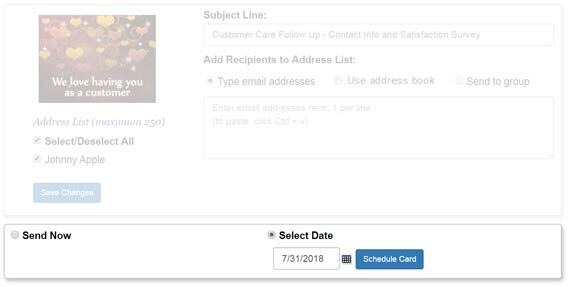 This tutorial covers the basic way to address, send, schedule and track eCards and invitations by using the address book or manually adding recipients' email addresses. If you are looking for other ways to share your eCards, such as in social media or from your website, view our Social Media eCards Tutorial or our Direct Link Tutorial. Subject lines are limited to 80 characters and are required to send an eCard. This is the text your recipient sees when your eCard appears in their email inbox. Creating an effective subject line is very important to ensure your recipient opens your message. Type your recipient's email addresses in the 'Email' text box, one email address per line. You can also copy and paste your list of email addresses (one per line) from another application or text file. When you are finished, click the 'Add Recipient(s) to Address List' button once, and your addresses will appear in the "Address List ". Note: This method of adding recipients limits you to 250 email addresses per eCard. 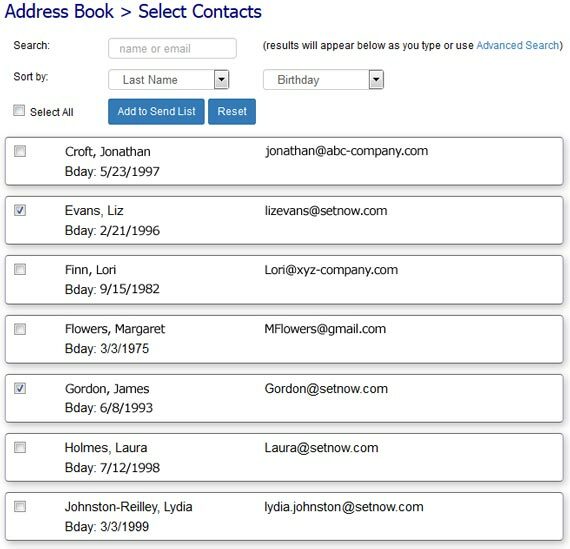 You must add contacts to your Address Book to use this feature. thumb_up Note: CorpNote enables the automatic insert of a first name in the greeting section of your eCards. If you selected the Autofill option, only the contacts from your address book or groups will receive a first name in the greeting line of your eCard. Groups allow you to easily address an eCard to more than 250 recipients. If you have created groups in your Address Book, they will appear in a drop down menu when you click 'Send to group'. Select a group and click the "continue" button to save your changes. If you added your recipients either individually or from the address book, then uncheck the box next to email addresses you do not want to include. You must click the 'Save Changes' button to de-select these recipients. If you selected a group, either choose another group from the drop down menu or choose the button for 'Type email address' or 'Use address book.' Once you add recipients using one of those two methods, you will no longer have a 'group' as your eCard send list. thumb_up Note: Scheduled eCards can be viewed by going to eCards > Saved/Scheduled. Click on the 'Scheduled' tab to see all of your scheduled eCards. You can edit the eCard or change the delivery date any time before the eCard is automatically sent. You can track your eCard/invitation views and respond to your recipients by going to eCards > Sent Cards. Click on the envelope or choose "View Recipients and Pickup Status" from the drop down menu next to each eCard. View statistics are recorded in real-time. For each recipient you will see whether they viewed the eCard, when and how many times. If the eCard included an invitation or survey, you will also see if they responded. For more detailed information, visit our Tracking & Responding tutorial.